The Detroit Red Wings knew what they had gotten themselves into going into game five against the Nashville Predators. It was the old guard facing elimination at the hands of the chic pick to come out of the west and the Wings dug themselves into a hole that stretched past the scoreboard. Pekka Rinne planted some serious doubt into Detroit with his net dominance and the young stars on the Preds had a hunger that overwhelmed Detroit from the beginning of the series. Tonight, they became the first team of the playoffs to be eliminated and officially began what will be an important summer for Big Red. 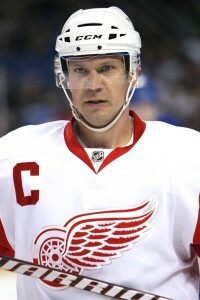 In what could’ve been team captain and eventual first ballot Hall of Famer Nicklas Lidstrom’s last hockey game, the Wings were soundly beaten in all three zones. Alex Radulov broke open the scoring with a fluky goal that was the direct result of a forecheck that seemed to wear down Detroit’s defense. Kyle Quincey should’ve been credited with an assist. Four out of the five games were settled by only one goal but again and again Nashville was able to stifle any momentum the Red Wings mustered off their breakouts. The Preds used the trap to hold up the Pavel Datsyuk led offense. While it didn’t make for the most exciting first round series, it has been the natural continuation of a trend in the western conference playoffs. Along with Nashville, every team that currently has a series lead in the west plays a defense first system. Phoenix coach Dave Tippett is renowned for his defensive philosophy, watching St. Louis is an instant cure for insomnia, and the Los Angeles Kings scored the second fewest number of goals during the regular season. Detroit is on the wrong side of that trend. Puck Daddy’s Greg Wyshynski summed up the series best when he described the closing window both teams are facing. 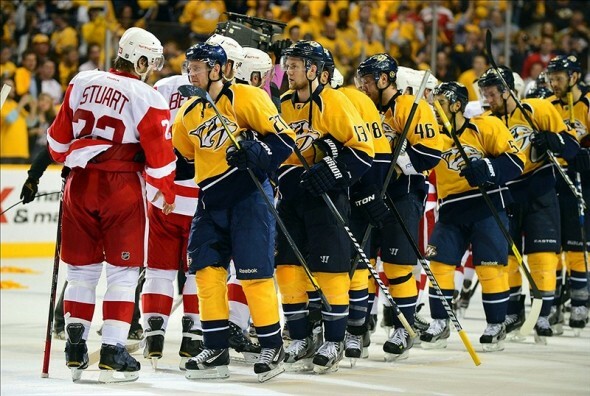 Detroit has an aging roster and Nashville’s free agent future is uncertain. While Wyshnski’s statement is true, the difference between the storylines is huge. All of a sudden Nashville has stepped out of the Red Wings’ shadow and are a young, intense team that looks scary from their crease and outward. Detroit native who was a Predator both times they were eliminated by the Wings, scored the series winning goal just 13 seconds into the 3rd period. With a minute left in the game the Predators fans were on their feet, Smashville took down Hockeytown. During the season the Wings showed that at times their still capable of playing with the top dogs. Their record setting home winning streak was awesome, but the team might’ve simply hit its stride at the wrong time. Momentum is everything in the playoffs and while it’d be easy to say Detroit’s finesse style of play lost out to Nashville’s brute strength and slight edge in scoring, the bottom line is that Rinne was the difference. He outplayed Jimmy Howard and planted enough doubt in Detroit’s offense to make Johan Franzen irrelevant while giving the Predators an extra cushion of security in every game they won. Nashville will advance to the second round of the playoffs while the Red Wings will return to the Motor City to clean out their lockers. Mike Babcock and Ken Holland will have a lot of decisions to make, as a few of their key players are heading into unrestricted free agency and there’s a concern over prospects coming up the pipeline. The guard has officially changed.